IT professionals don’t always have their preferred tools at their disposal. Sometimes this is because of budgetary issues. Sometimes it's simply because management has always done things a certain way, and nobody wants to rock the boat and challenge their assumptions about workflow and processes. That’s unfortunate since so much depends on speed and accuracy when doing a major project like a Windows 10 migration. It’s worth keeping in mind that the investment you make on the right IT project management tool will be more than offset by the time and money you save by deploying it! 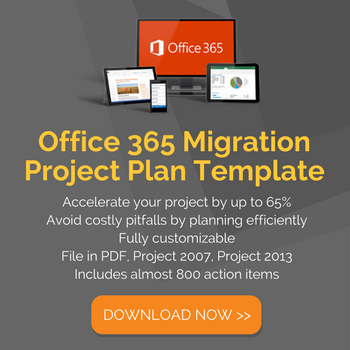 You can easily make a business case for implementing a migration tool based on these savings. Looking back over the more than 5 million assets we helped get ready for migration, the Juriba team could not imagine going back to managing enterprise Windows migration by handing out dozens of out-of-date spreadsheets and hand-cranked databases. This is clearly a waste of time and resources in any IT department given the alternatives now available. Today, we will walk through each step of a typical enterprise Windows 10 migration and model exactly how much more efficient it is to use an IT project management tool that provides data warehousing, automation for many processes as well as a central command and control center, versus the traditional way of "winging it" with spreadsheets and hand-cranked databases. 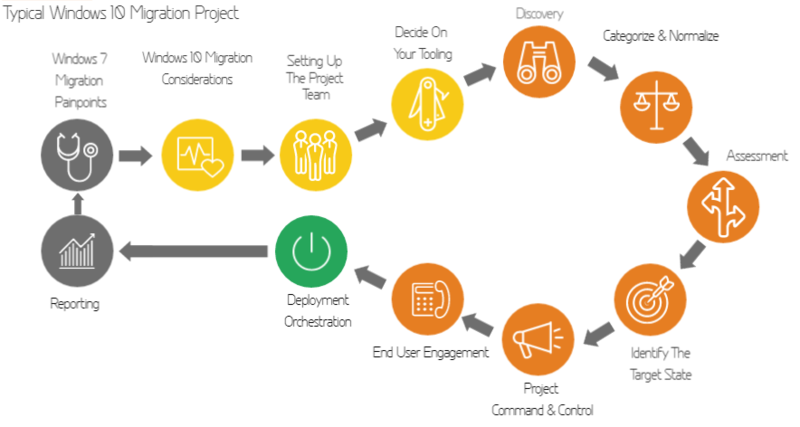 The outcome is astonishing: For our example project, it will take approximately 124 total man weeks to finish a migration using traditional methods, while you only need 44 weeks when using a dedicated IT project management tool. That’s time and money saved that you can now devote to more pressing matters that will boost your bottom line. Today, we will be looking at the steps from deciding on your project tooling through to reporting as these are the areas in which the correct project management tooling can bring most benefit. 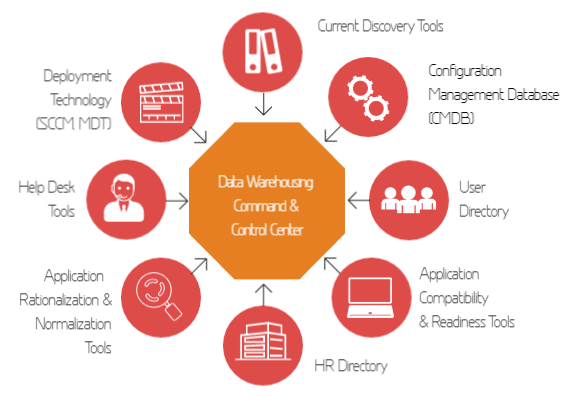 The accelerated path using sophisticated data warehousing tools that provide you with a central command and control center. Keep in mind that by going the traditional route, you run the risk of information getting out-of-date as soon as it leaves your hands. The fact that this method does not allow for working with large data sets, and you cannot do real-time activity tracking, makes things worse. By selecting the right tooling, however, you will work more nimbly, and the information you are working with will always be up-to-date for the entire team in real-time. You can now manage your IT migration project from just one command and control center. After high-level planning, approvals, budgeting and staffing are taken care of, we need to identify the scope of the project. Traditionally, IT project managers would focus primarily on the first hurdle; getting hold of the required data. Many forget to consider what they are going to do with it once they have it. While this is short-sighted, it is understandable, as the discovery phase is overwhelming if you have nothing else to work with other than a few manually cranked data feeds. The common problem here is that project managers will manipulate the data and as soon as that first spreadsheet change is made, the data will become static and difficult to refresh. If you have more feeds to populate and an outcome to link users, computers, applications, mailboxes, departments and locations then this issue grows exponentially until it becomes unmanageable. Using an IT project management tool will shave 24 days off of a traditional 4-week project. You’ll be able to quickly gather, validate and manage critical project information, ranging from user location to details on hardware and what applications have been installed — all in a matter of days. This is because proper tooling knows what to import, how to import it and where to get it. And the best part is that you now have a single pane of glass through which you can manage your project with data that can be refreshed at will due to a production ready ETL (extract, transform and load) process! According to BDNA, an enterprise's Windows 10 migration project will affect, on average, about 1,500 applications. 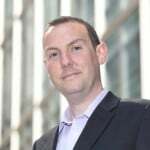 Your IT teams will need to identify which applications are relevant and known, which are irrelevant, and which are unknown (e.g., in-house developed applications or niche software), and filter out all that is irrelevant (e.g., hot fixes and security patches). Next they will need to categorize them for taxonomy and normalize them so that you are not looking at thousands of application data rows on a spreadsheet, but only the master application list. Following the traditional route typically requires a minimum investment of 6-8 weeks. This is a very labor-intensive process that will have you devoting a team from your already overburdened department to sift through thousands of rows of data. With an application normalization tool you can accomplish this in just one week. Our system will automatically categorize and have your applications normalized to major versions to create a solid and actionable catalog of all known software currently deployed. 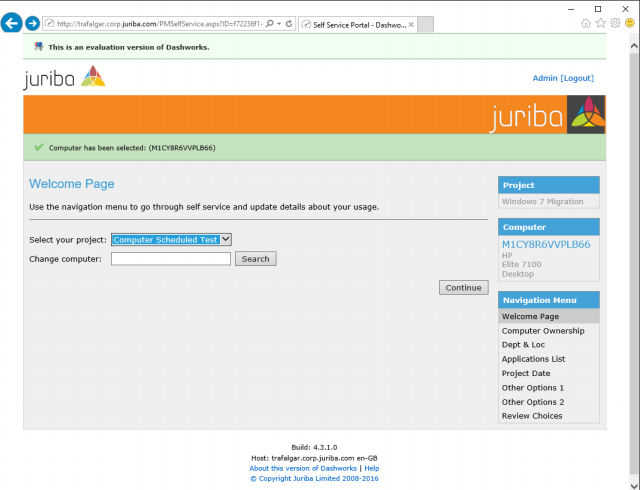 Below you can see a screenshot of the tool, demonstrating the integration with the software catalog. As any seasoned CTO knows, assessing Windows 10 involves identifying the project workload according to the number and types of applications and hardware that must be moved. You have to check which applications are compatible, the existence of an upgrade path their current lifecycle status (i.e. are they in support / a security risk) and whether or not you must do more testing. The same is true of your hardware; which can be in=place upgraded, which need a wipe and re-load and which need replacement. Trying to manage a complicated task like this without a project management tool would be folly, building the link between the user, their computer(s), the applications residing on those computers and calculating overall compatibility is not a simple task. However, if you do attempt it, plan on spending a minimum of 4 weeks on this. Instead, an IT project management tool helps you determine, within just a few hours, which assets are compatible and your level of hardware readiness so you can prioritize the ones with the biggest problems to sort out. Is your team getting ready to replace every computer? Will you be upgrading to the latest version of each application in use? Identifying the target state traditionally requires at least a 4-week investment since you must manually trawl the applications list in your spreadsheet. When forced to work this way, you will be hitting targets at random rather than in an organized and prioritized way, and building something that will be difficult to maintain. You can cut the needed time in half with a project management tool that gives you a centralized place for defining rules and making critical decisions for the migration once per application with the impact of that decision flowing down through every user and computer impacted by it. 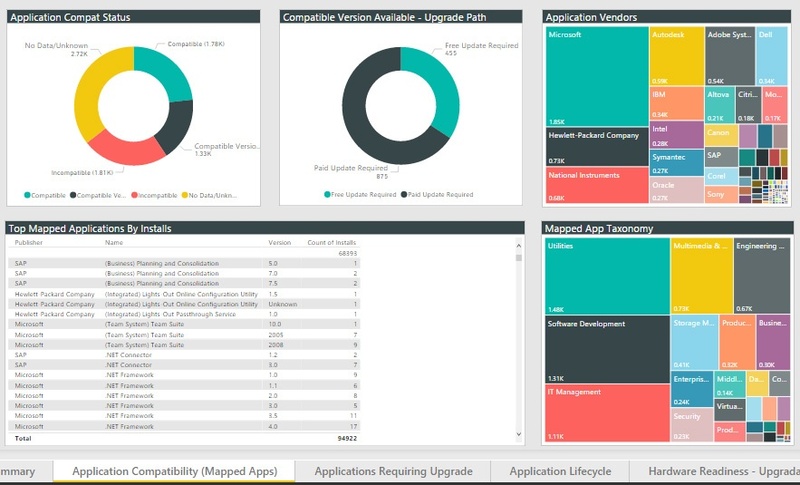 As you can see from the screenshot, you can easily filter out all applications that have no compatibility issues (green), that have known issues but a compatibility path is available (amber), and unknown or problem apps (red). The irrelevant applications (about 80-90% of the total application count) have already been filtered out. Now, we are entering the critical stage of your project where the rubber needs to hit the road! Depending on the size of your migration, command and control of your Windows 10 project can take an average of 32 weeks, under ideal conditions. But the problem here is trying to track and manage literally thousands of asset readiness tasks. Your project resources are less efficient, spend their time managing data and not actions, and lose productivity due to a lack of accurate, real-time information that pushes back the project. Handing out a stack of spreadsheets does not make sense when you can instead deploy a dedicated IT project management tool and finish the job in an average of 24 weeks (saving two months). All changes will be reflected as they occur, and you will have real-time version control despite working with complications like multiple offices in different time zones and business scheduling restrictions. You want your end users to be satisfied, and engaging with them is essential for the success of your project. It would be impossible to engage with tens of thousands of your users when doing this manually. Just think of all the preparation, scheduling and re-scheduling emails you would need to send! Imagine tasking a member of your support staff with visiting all employees and asking them about which applications they’ve installed as you manually audit their environment. Information that is out of date as soon as you have collected it. All this, done in the traditional manner, can take up to 24 weeks of effort. With a project management tool, you can better engage with each employee (automatically) and finish the job in a mere 2 weeks by employing a repeatable process. From automating email communications and customizing communication to send text messages to those who prefer them to email, to setting up a portal for self-service, you will lessen the workload on your project managers significantly. Now that deployment of Windows 10 is imminent, orchestrating it will take 24 weeks under the traditional, manual approach. Unfortunately, manual deployment is not scalable. You need to generate lists periodically from multiple sources, pass the latest lists between teams and manually execute deployment. Such a labor-intensive project cries out for a dedicated IT project management tool, which lets you finish the work in just 4 weeks of effort. You can automatically trigger all activities from one command and control center and perform zero-touch build with the correct application set and configuration for each unique end user through simple configuration. When it’s time to deliver reports in your enterprise if you only have traditional means at your disposal (that is, doing it manually and with spreadsheets and hand-cranked databases that go out-of-date once created) becomes a full-time job. Gathering data, manipulating it into the right format, generating pivot tables and charts and finally publishing it all takes time which could be better spent elsewhere. The total time investment could reach 20 weeks under traditional methods. With the helpful acceleration of an IT project management tool, the total reporting time is reduced to 4 weeks. You will leverage pre-canned reports and work with a customized dashboard set up for your enterprise’s unique reporting requirements. What’s more, the project management tool lets you quickly drill down into the data, access analytics and instantly reprioritize capabilities. 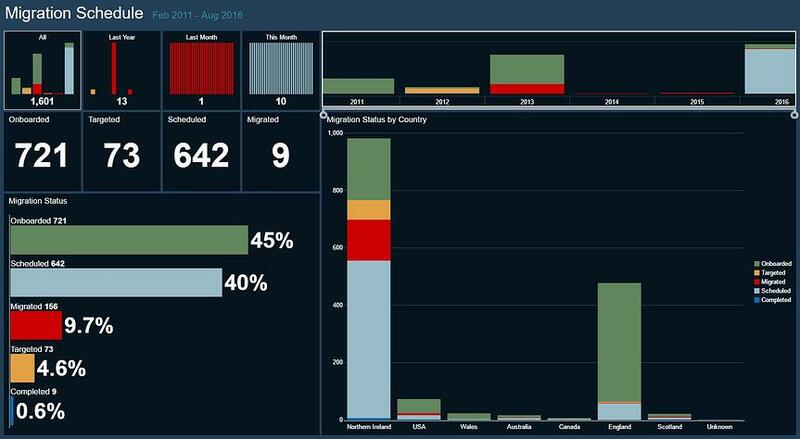 Dynamic, real-time dashboards with no additional work! 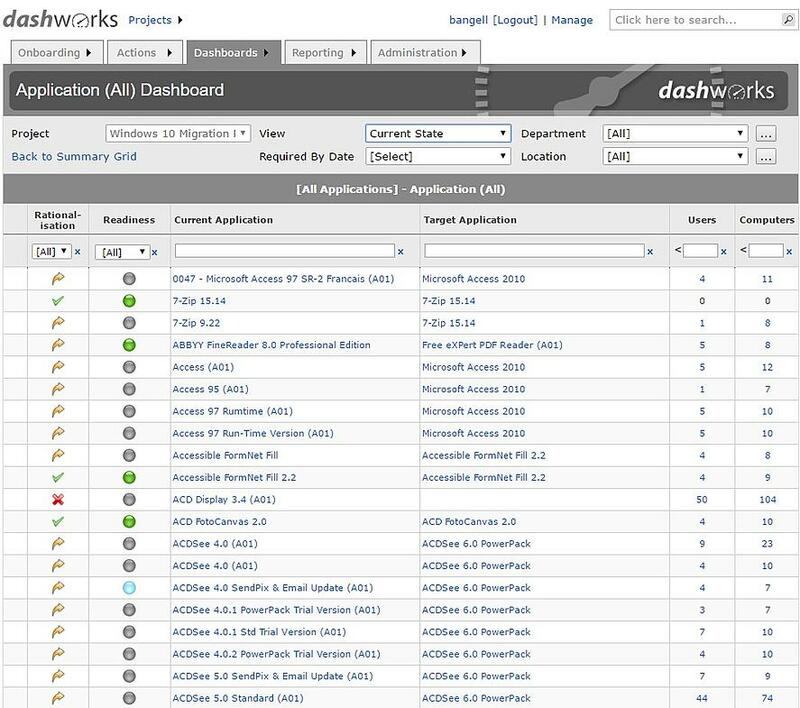 With this information in hand, it is easy to make a business case to use an IT project migration tool, like Juriba’s Dashworks, when preparing to do a major Windows 10 migration in your enterprise. You’ll save time, money and countless hassles as you migrate the thousands of assets involved. The result is an accelerated project and more productivity in your organization.